'Oz' Is Officially a Hit! Is March The New Huge Movie Month? For years, March was a month that fared little better than the box office wastelands of January and February. After the endless rom-coms and schmaltzy dramas would come the awful horror flicks, cheesy kids movies, and thrown-together comedies, a slowly rising slope up to the big box office successes of May and the following summer months. Enter the year 2012, when The Hunger Games (over $408 million total and over $150 million on opening weekend), Dr. Suess’ The Lorax with an opening of $70 million, and even the hilarious, clever comedy 21 Jump Street (just over $138 million total) swooped in and made all the March numbers that came before them look bad. 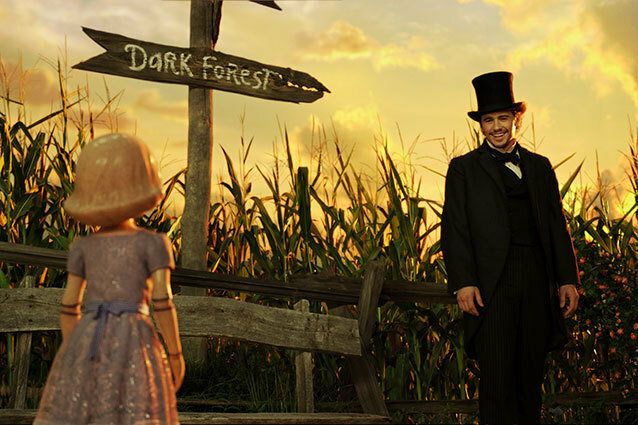 Now, with Disney’s James Franco-starrer Oz the Great and Powerful raking in the highest weekend box office numbers of 2013 with $80, 278,000 (for context, that’s not far from November 2012’s mammoth Skyfall box office numbers which came in at just over $88 million), a question starts to arise: is March the next big movie month? The answer isn’t exactly cut and dry for many reasons, the most important of which is that Oz is just the first of many opportunities for big box office bucks this month. Still, its earnings do make it the third-highest March opening weekend in history and when the box office totals from March 2011 to March 2012 have increased by a whopping 73.9 percent, according to numbers from Hollywood.com’s own Paul Dergarabedian, in addition to 2012 seeing the biggest single March box office success in The Hunger Games, it’s worth taking a look at the month’s potential for further greatness. In the past, March has proved a fertile spot for films that might have had trouble standing out in great expectations periods during summer and late fall. A quick look at the two films standing between Oz and the top spot as March’s biggest ever release, are The Hunger Games at number one and the Disney 3D adventure Alice in Wonderland at number two, with a record $116 million and change during its 2010 debut. The easiest comparison is that of Alice to Oz. Both visually stunning Disney flicks debuted in March, a sort of safe place for films whose premises may not be able to compete with the action and superhero power of a May or July movie. But the safety of a March release also provides fertile ground for potential expansion upon each fantasy flick. After seeing a billion dollars worth of international success, Alice was slated for a sequel almost immediately, and though Disney’s potential dollars bonanza has yet to secure returns from director Tim Burton or star Johnny Depp, the film is still on its way. And after a strong opening weekend like Oz’s, a sequel isn’t far behind (after all, the continuation of this tale makes just about as much sense as the sequelization of Alice’s journey). In fact, the Mouse House was already on track to develop a sequel before audiences flocked to the theaters this past weekend. The Hunger Games enjoyed a similar, but far more fruitful debut. Suzanne Collins‘ Young Adult fiction series had already sold 26 million copies when the film adaption was released to a mass audience, so its success was fairly expected. For the violent story of young people killing each other in a heartless national gameshow, March served as the perfect place for a trial offering to a wider audience. The film, whose plot wasn’t exactly accessible, may have been swallowed up in a more saturated month, but in March, it served as the event for the first half of 2012. It’s this financial success that allowed its sequel The Hunger Games: Catching Fire to shift to the covetted Thanksgiving weekend release slot formerly enjoyed by big-time adaptations like many films from the Harry Potter series and The Twilight Saga: New Moon in 2009. And while the Alice in Wonderland slot has already been filled by this year’s Oz, the potential for a high-grossing Young Adult adaptation and flashy, 3D kids cartoon are still up for grabs. March has been a fertile month for fantastical computer-animated cartoons with big-name stars for years, going back to Ice Age in 2002, its sequel Ice Age: The Meltdown in 2006, and even the soon-to-be-sequelized How to Train Your Dragon in 2010, all of which have been splintered off into cartoon series and one-off DVD movies as well. With the exception of 2012’s Hunger Games sensation, the last five years have been won by kid stuff (with the exception of Alice in Wonderland, though it was arguably a bit of a hybrid of a goofy kids cartoon and a stylized action movie — don’t blame me, blame the Futterwacken). And since 2009, those big flicks are always presented in 3D, adding even more money to their sizable incomes. Even last year, The Lorax presented an opportunity for a little quick 3D cash (over $214 million in total). In 2013, The Croods, a visually stunning cro magnon-man tale featuring top of the line 3D animation and the voices of Emma Stone and Ryan Reynolds steps up to try to take up the mantle of its Dreamworks Animation predecessors. And while its premise doesn’t have the nostalgic draw of The Lorax, it could be creative enough to pull in Dragon-level numbers (the Dreamworks flick raked in a total of $217,581,231 in 2010). And on the Young Adult front comes an adaptation of Twilight mogul Stephenie Meyer’s followup to her vampire saga, the alien romance The Host. While The Host doesn’t include an audience as robust as Twilight or Collins’ Hunger Games series, which was out in completion before the films even started rolling, it does bear Meyer’s name which is inextricably tied to the concept of consuming romantic drama. Plus, the book did spend 26 weeks on the New York Times Best Seller list. It has an audience — though the rabidness of that audience is less certain. Where the Hunger Games‘ March release was taking advantage of the March market, taking the chance to be the big fish in the small pond, The Host is a little more of a gamble, banking on the hope that Meyer’s name can help get viewers past the complicated alien plot and into the turbulent romantic world of the author’s latest heroine. The placement of The Host in this month further solidifies March as an exciting moment in the carousel of new releases each year. March has become the place for the potential next big thing. In 2010, Alice in Wonderland was bested in overall box office only by Toy Story 3. Despite critical opinions, the film out-grossed Harry Potter and the Deathly Hallows Part 1, Inception, The Twilight Saga: Eclipse, and Iron Man 2 that year. Likewise, in 2012 The Hunger Games enjoyed a bigger opening weekend than Twilight’s saga-ending Breaking Dawn Part 1, and the Jennifer-Lawrence-starrer was bested only by the trilogy-ending The Dark Knight Rises ($158,411,483 in its first weekend) and Marvel’s The Avengers (a staggering $207 million in its first few days). If the past few years have taught us anything, the year’s biggest movies don’t just hit during the summertime and during holidays anymore. March has gotten in on that game and in a big way. From now on, it appears we can look to March as the breeding ground for potential hits and phenomena, and while it doesn’t hold the guaranteed income of a Thanksgiving weekend, it’s proved that it can yield something just a great and, in some cases, even greater.